Halfords Yuasa Racing left Donington Park with a proverbial spring in its step as an ultra-successful weekend yielded a race three one-two with Matt Neal leading Gordon Shedden home in formation. This ensured the Team Dynamics-run squad retained top spot in the Teams’ and Manufacturers’ tables as well as first and second spots in the Drivers’ standings. It was an astute exercise in damage limitation from the outfit that would lay the foundations for a late-weekend surge. 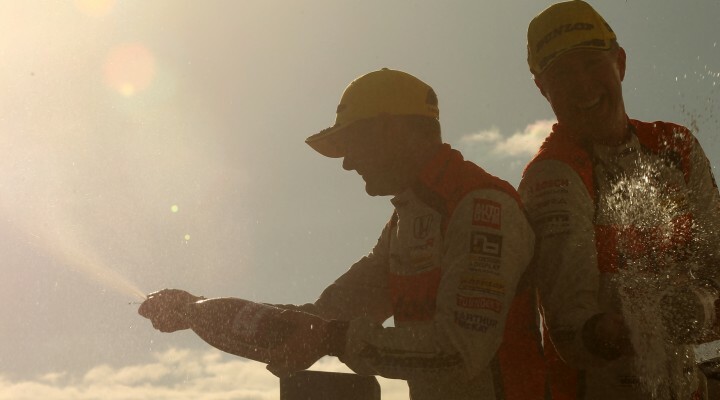 As Neal and Shedden headed up the championship standings on the way into the Donington Park weekend, they were liable to carry 75 and 66kgs of ballast respectively. Teams can use the soft tyre in each of the three races a maximum of three times during the course of the season – Honda elected race one at the Leicestershire circuit as one of those occasions. The thinking behind this was that the soft tyre – with maximum ballast, the circuit characteristics at Donington Park and changeable, cold conditions – would not yield the same level of performance over a race distance as the medium compound Dunlop SportMaxx tyre. This proved to be the case in race three with the BMWs of Sam Tordoff and Jack Goff eventually dropping away from the medium-tyre shod Hondas, amongst others, towards the end of round six. On Saturday with that tyre choice made, Shedden qualified fourth and Neal followed up by sticking his Civic Type R into ninth spot on the grid. The two drivers knew they would face an uphill struggle in the opener, with that success ballast from Brands Hatch two weeks earlier and the less durable soft-compound tyres. Race one duly yielded lower points-scoring finishes for the team – 11th and 12th but the soft tyre was now out of the way. Honda had taken the performance penalty along with their success ballast, in a round they would be most hindered in, leaving the plan to play out nicely – starting with race two. With the ballast removed and the harder-compound Dunlop rubber bolted onto their Honda Civic Type Rs, the experienced team-mates moved progressively through the pack. Displaying strong pace, they flashed past the chequered flag in fourth (Shedden) and sixth (Neal), with the Scot barely a whisker shy of the rostrum. This left the duo perfectly placed to take full advantage of the race three reversed grid format, scything their way to the front of the field and overhauling the early leaders to speed to a commanding one-two finish, as Neal tallied his first victory of the season to prove that he remains every inch the class act in his 26th campaign in Britain’s premier motor sport series.